Features impeccable detail and a huge mouth-full of teeth! Are those the lights flickering? Well, that can only mean that the Demogorgon is near. And, as it turns out, it is! Watch the walls, shoppers, we have a special 6” Demogorgon Pop! Vinyl for you! 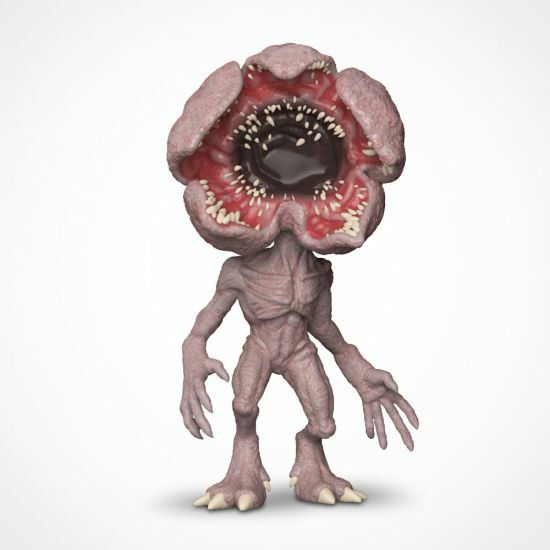 We’re pretty sure this Demogorgon Pop! Vinyl doesn’t travel through dimensions. But, just to be on the safe side, try really hard not to cut yourself while you have this figure around. It is modelled on the realistic face-mouth sort of situation that seems to be the look of cross-dimensional monsters. But, in classic Funko style, its head has caricature-style size going on, meaning this meanie looks far more menacing with much bigger teeth (how Upside Down dentists must be cleaning up!). To add to the creepiness, Funko have decided to break away from the norm and make this Pop! Demogorgon bigger than the usual size. This scary beast stands 6 inches tall, which is around 15 cm – enough to bring sufficient amounts of gut-wrenching fear to your collection. Whether you display the Demogorgon standing up or upside down (yeah, that happened), you are sure to cause a fuss in your home or office! From the first time that we saw its silhouette on the road, the Demogorgon has captured our imagination… and our friends. Now it can capture your Pop! Vinyl collection, too!